The outgoing President of the Thailand-based Asian Institute of Technology or AIT, Professor Worsak Kanok-Nukulchai, is an unconventional academic. He is an engineer by profession. But his intellectual penetrations have not been limited only to engineering. He talks about art, humanities, social sciences and languages with authority. His latest passion has been the involvement in an inquiry into telomere shortening and its connection to ageing. Telomere is the compound structure at the end of a chromosome that decides on the ageing of a person; shorter this compound, the more aged a person has been. But his real interest and therefore concern has not been searching knowledge for himself. It is about the future, the future of the knowledge based society we have created and how it could be continued without allowing it to collapse on itself. This concern is then linked to the knowledge requirements in the future and how the current educational system could train people – both students and adults – to be its partners. Thus, Worsak lives in all the three time dimensions – past, present and future – simultaneously. 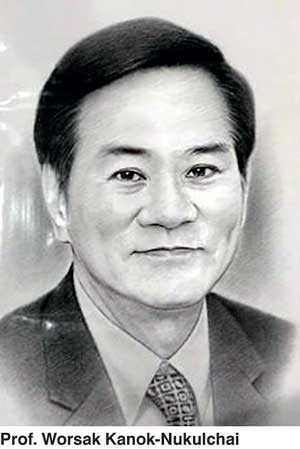 He draws lessons from the past, assesses the state of affairs today and makes plans for the future. I have written on his wisdom on how digital natives – a term he had coined to describe the modern tech-savvy youth – should be converted to global citizens in a previous article in this series (available at: http://www.ft.lk/w-a-wijewardena-columns/How-to-groom-intellectuals-for-the-future--Two-contrasting-views-from-Thailand-and-Sri-Lanka--Part-1/885-648278 ). A global citizen is a person who has moved out of the boundaries of nation states to the world out there and got himself seamlessly integrated to its governance, trade, commerce and above all its technological advances. Worsak thinks that when the youth are groomed in a particular way, they would be able to face the unknown future without fear. For that, he says, the present educational model which was designed to serve the industrial revolution in the 19th century is ill-suited. In that model, students depended on teachers to impart the whole knowledge. At AIT, groundwork has already been laid to develop AI and be a partner of the future AI driven world. Already a dummy policeman who would be placed at roadsides to detect and report on traffic law violators has been created by AIT scientist Dr. Mongkol Ekpanyapong and supplied to Thai Police for use. AIT will also collaborate and partner with other leading researchers on AI to build a sound base for this new technology. Recently, an AI expert team from Japan met the AI experts of AIT to cement these relationships. What Worsak has predicted about AI has been corroborated by the results of a survey done on 1634 experts by Katja Grace of the Future of Humanity Institute of the University of Oxford in UK (available at: https://www.technologyreview.com/s/607970/experts-predict-when-artificial-intelligence-will-exceed-human-performance/ ). This survey has revealed that intelligent machines will go for training as humans do today in about 12 years’ time. Within the next 40 to 50 years, these machines will begin to write New York Times bestsellers and perform surgeries. In another 125 years’ time, they are predicted to gain capability for handling all human jobs. According to Worsak, that is a process involving mankind to gain wisdom eventually by converting information to knowledge and knowledge to wisdom. Information which is available everywhere constitutes combined bits and pieces of data. Mastering those data will help a person to gain knowledge by understanding the related information. Wisdom is nothing but personal mastery of applying knowledge. 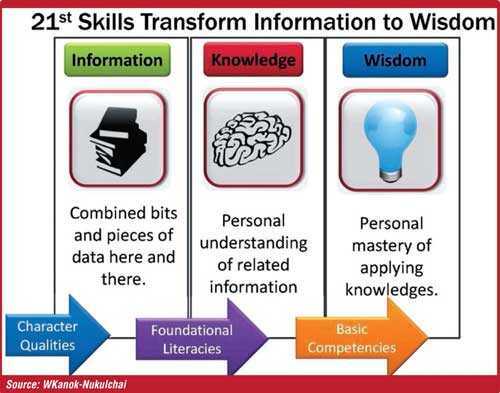 Worsak says humans will not be able to transform information to knowledge and knowledge to wisdom unless they acquire some basic competencies called ‘universal basic competencies’. They include knowledge of science, technology, engineering and mathematics, known as STEM plus humanity and skills needed to go through a lifelong long learning program. It is the duty of education to equip everyone with these basic competencies. But the situation in Thailand is the opposite of what Sri Lanka has been experiencing. There, the number of places at universities is pretty much higher than the number demanded in each year (visit: http://monitor.icef.com/2017/10/thailands-growing-supply-demand-gap-higher-education/). But the market they operate is shrinking every year making it difficult for universities to fill all the vacancies. At the same time, a large number of students are proceeding to countries like Australia, UK, USA and Canada for higher education. This also has reduced the operational market for universities. As a result, many universities in Thailand are faced with the problem of closure unless they could go through a downsizing program. Hence, Worsak says that Thailand will have to attract foreign students or use universities as a lifelong competency acquisition outfits or both. Lifelong learning is a must in today’s context since the wisdom which a person has today will become obsolete pretty fast due to rapid changes in technology. Take for example a surgeon. With the advancement of machine learning surgery methods, surgeons will become irrelevant in the curative healthcare systems in the future. These surgeons then have to place them on a continuous learning path and that learning has to be continued throughout his life. 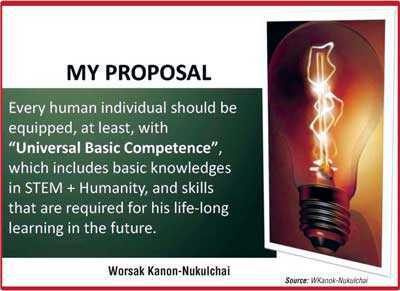 Worsak says that in a world of volatility, complexity, uncertainty and ambiguity, everyone should have right to acquire universal basic competencies. To meet this demand, three to four year undergraduate degrees should equip students with universal basic competencies by providing a holistic education to them. Then, students should be provided with further one to three year study programs to enable them to acquire professional credentials. The balance 40 to 50 years of life should then be devoted to lifetime learning at universities. If this is not done, the modern knowledge based society runs the risk of collapsing on itself. 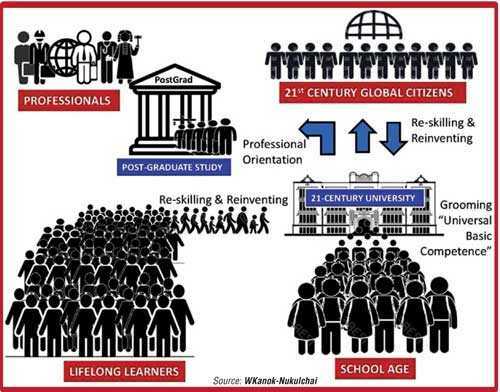 The failure to undertake lifelong learning will also obstructs the move to produce the global citizen of the 21st century. In the Worsak model, the future university will groom students in basic universal competencies, on the one hand, and provide opportunities for all to undertake lifelong learning, on the other. Quite independent of universities, there stand the professional bodies. This defines the model of higher education as presented by Worsak. It has information delivery to students in a combined work of teaching and learning within a given time period. Students are traditional, professional or lifelong learners. Worsak says that future universities will serve students of all age groups to access learning in real time or on demand, from anywhere, in multiple modes, to suit their lifestyle or their work and other activities.